ca1932: As a child, he encountered Seiu Ito's torment art in the book Documentation on Abnormal Customs, which he found in his grandfather's book collection. 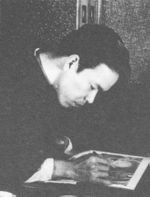 ca1945: Suma was discharged from the Navy and wandered across Japan and was employed at various jobs before becoming an editorial reporter for the evening newspaper Central Kyoto News..
1950: The name Reiko Kita began to appear on Suma's work[Citation needed]. 1951: Began full participation at Kitan Club[Citation needed]. 1954: Travels to Tokyo in the autumn of 1954[note 8]. He meets Seiu Ito in person for the first time[note 9]. 1962: Passed the editorial baton to Chimuo Nureki, who became Uramado's new editor-in-chief. Suma worked on editing "Light" and the girl's magazine "Lyric Literature". 1970: Suma and Chimuo Nureki left Kubo Shoten and founded Abu Production, where Suma was an executive head. They published Abument which terminated on Sep. 1970. 1989: The documentary video "Jouen - The world of Minomura Kou" was made by Syoichi Yoshimura. Directed by Haruki Yukimura. Chimuo Nureki, Oniroku Dan, Tetsuro Sakuragi, Go Arisue, Yoji Muku and Syoichi Yoshimura appeared on the video. This Toshiyuki Suma is not yet finished.